Museums are a great place to explore cultures and create new knowledge. Where are the must see and visit museums in Sydney? Powerhouse Museum is great as its exhibits change regularly. They also run school holiday workshops. Australian Maritime Museum is very interactive and the Australian Museum has awesome dinosaur exhibits and is child friendly. 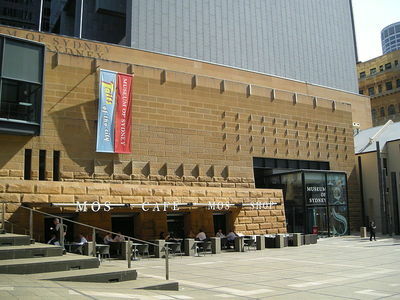 The Museum of Contemporary Art (accessible from The Rocks), and the Art Gallery of NSW are both great to visit too. The MCA is almost always ranked in the top 5 things to do in Sydney and is Australia's main dedicated museum of its kind, with a store that sells unique locally made items. Exhibits are always changing and varied, so even locals like me find themselves visiting often. The MCA has a stunning rooftop terrace that serves decent snacks and coffee with that Harbour view as a bonus too. Agree, Powerhouse Museum. Fun, interactive and education. The Australian Museum is great for history buffs. Also like the Museum of Contemporary Art. I also like the Powerhouse. Always something new and interesting, for all ages. The Jewish Museum is a different choice. Its located in Darlinghurst. Its a smaller museum but extremely interesting and very moving. It is definitely worth a visit for students studying European history and also for anyone else who is interested in Jewish history and culture. My favourite is the Australian Museum located near Hyde Park in the city. The wonderful thing about this museum is that it simply contains so much that will engage you when you visit. The temporary exhibitions keep things fresh and interesting and the upper levels with the unchanging exhibits are just filled with variety. The current Tyrannosaur exhibition is showing until the 27th of July, 2014 and the Wildlife Photographer of the Year exhibition is showing until the 1st of June, 2014. I visited the Australian Museum with my friend and we had such an amazing time. He loved everything dinosaur related while I really appreciated the photography exhibition along with everything else. Best location for a BBQ in Sydney? Best place for brunch in Sydney? Best massage parlour in Sydney? Best indoor pools in Sydney? Best sneakers or runners brand? Best snack to pack in a kid's lunchbox? Best way to eat blueberries?